Many people think that if they just apply to every job out there, they will find that perfect job. They call this the “spray and pray” method. That is like buying lottery tickets and expecting to live off the winnings. It rarely happens and indeed, is very unrealistic. The best approach to landing that great new job is to prepare and start with a plan. Take stock of yourself as a person and an employee. What do you really enjoy doing? Can you articulate your special skills and areas of expertise? What motivates you? Do you know your ideal work culture? This type of evaluation will help you identify your best-fit career and is an important first step that sets the foundation for a successful job search. Break your job search into specific, manageable steps that keep you moving in the right direction. This will increase your odds of success and also speed up your results, which is especially important if you are working full time and need to be efficient with your time. Work in a logical progression. The steps build upon each other, so the right order is important. For example, if the job you want requires skills that you don’t possess, one of the first steps in your career plan should be to acquire those skills. Planning strategically will help you move toward your goal while maintaining control over the process. Track your progress. Ongoing monitoring helps you analyze the effectiveness of everything you are doing. If something is working, then keep doing it. If it is not working, either change it up or stop doing it altogether. Progress is made one step at a time and acknowledging all your little successes along the way will keep you motivated and build your self-confidence. Keep a record of your efforts. Whether you use an Excel spreadsheet like I do or handwritten entries in a notebook, log all the companies you contact, networking events you attend and jobs for which you apply. This will help you stay organized and ready for when an employer contacts you to schedule an interview. As a Career Coach, I offer an objective view of the current job market, employers’ needs and jobseekers’ marketability. Over the years, I have developed a proven job search process that helps my clients win interviews with their target companies and land great job offers. I put together a customized weekly job search plan for each of my clients that reduces their frustration and keeps them moving forward. As your collaborative partner, I will help you identify your specific career goals, create a strong resume that positions you for the role you want and then develop an strategic job search plan to get you into that new job. You’ve made your New Year’s resolution. Now set yourself up for success through planning and preparation. 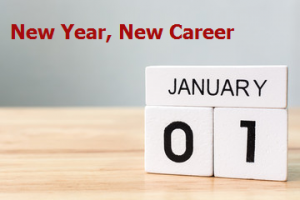 Let’s work together to make that career goal a reality, while employers are busy filling their 2018 positions. An inspirational Career Coach, Resume Expert and Certified MBTI Practitioner, Trish Thomas McGrath has been helping people develop the tools, strategies and confidence to build satisfying careers since 2009. She guides them through the job search process to make it less overwhelming and more successful. Contact Trish today to see how she can help you gain the competitive EDGE. (860) 658-6480 or trish.thomas@edgecareersolutions.com.